As evidence mounts, there is growing concern neonicotinioid insecticides may play a role in the declining health of pollinators and other wildlife across North America. A string of unfortunate and widely publicized events, have placed this class of insecticides at the center of the debate surrounding pollinator decline. This publication provides turfgrass man- agement professionals with suggestions aimed at minimizing the potential negative impacts of neonicotinoids and other insecticides on pollinators. Neonicotinoids are extremely toxic to bees and despite the fact that turf and ornamental systems comprise only about 4% of neonicotinoid usage in the U.S., they are still the most widely used insecticides in turfgrass systems (Table 1). Products containing the neonicotinoids clothianidin, dinotefuran, imidacloprid, and thiamethoxam represent a useful set of chemistries for controlling several key turfgrass insect pests. However, their breadth of use does carry with it some risk of pollinator exposure. Not only do neonicotinoid insecitcides exhibit strong contact activity against insects, they also act systemically, being taken up by plants and distributed throughout plant tissues via the plant vascular system. As a result, neonicotinoid insecticides may end up in various plant tissues, including nectar and pollen, for an undetermined amount of time. Avoid treating these areas with any insecticide. This is consistent with most insecticide labels that advise against applications to blooming, nectar-producing plants that attract pollinators. Remove weeds with herbicide (Fig. 4). Effective weed control should be a prerequisite for using insecticides in turfgrass. Mow the turf immediately before spraying any insecticide. Mowing will remove ≥ 90% of the flowers and reduce pollinator foraging. 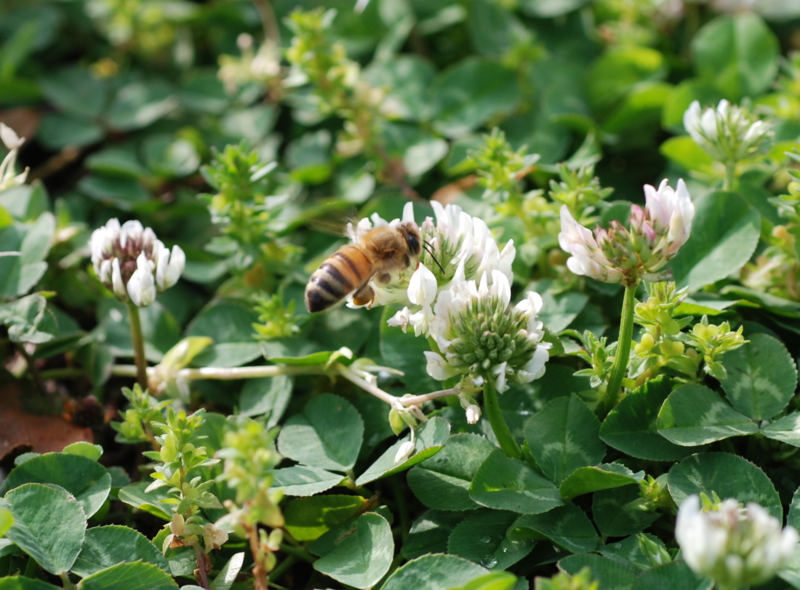 When neonicotinoids are used, mow frequently enough to keep these blooms from returning as neonicotinoids may be taken up from the soil and moved systemically throughout the plant for an extended period of time. Figure 3. 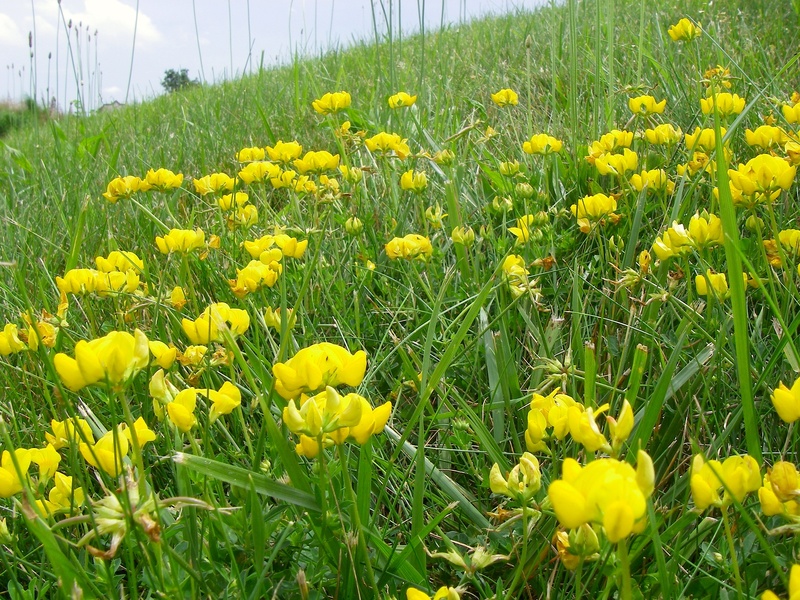 Birdsfoot trefoil is attractive to pollinators and is especially common in low maintenance turfgrass. Figure 4. 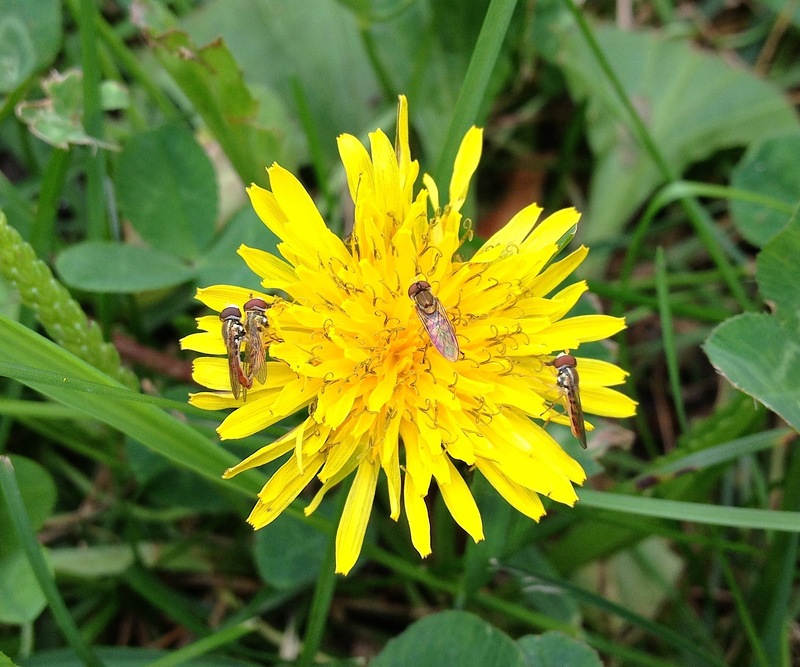 Judicious use of broadleaf herbicides can dramatically reduce the incidence of flowering broadleaf weeds that are attractive to pollinators. The area to the left of the dashed line in the photo was untreated while the area on the right was treated with a broadleaf herbicide. Systemically active neonicotinoid insecticides applied to protect the turf could inadvertently be taken up by flowering plants within adjacent landscape plantings. Leave a buffer strip of 2-3 feet between the treated turf and the border of any landscape bed to minimize the potential for unintended uptake of neonicotinoid insecticides by the roots of flowering ornamentals (Fig. 5). Figure 5. 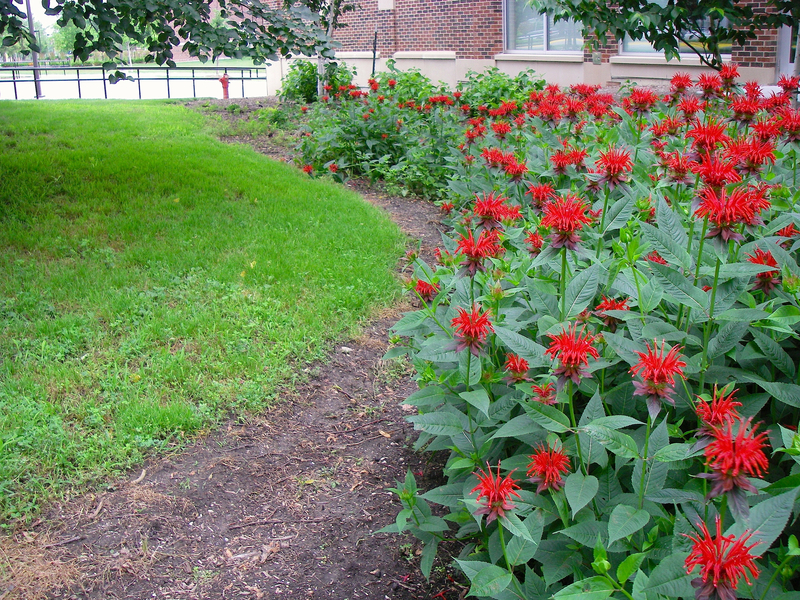 Landscape beds often contain flowering plants that are attractive to pollinators. 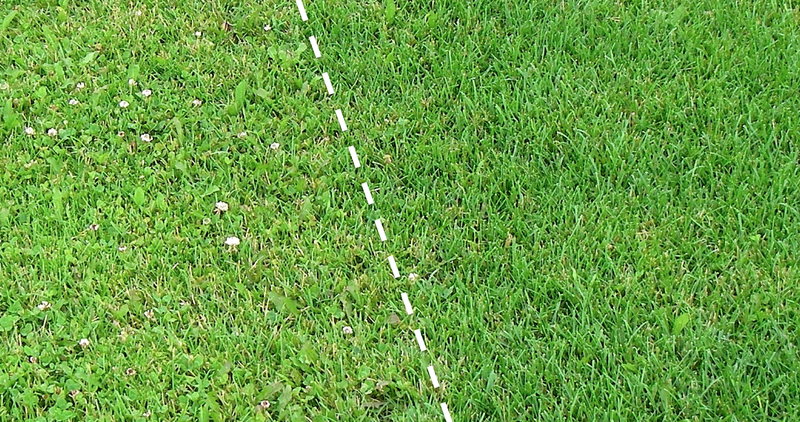 Leaving an untreated buffer strip between the turf and bed may help reduce the potential for unintended uptake of neonicotinoid insecti- cides by flowering plants following applications targeting turfgrass insect pests. Wait until flower petals fall before applying neonicotinoids. After petal fall, pollinators will not be attracted to these plants. Never apply any insecticides directly to the blooms of flowering plants. The potential for neonicotinoids to persist and move into the flowers of trees and other ornamental plants one year after application is not currently known, so insecticide use in and around such plants should be limited as much as possible. Although there appears to be no immediate threat of losing neonicotinoids from our insect management arsenal, there are plenty of alternatives available for use against key turfgrass insect pests. See Table 2 for a list of turfgrass insect pests controlled by neonicotinoids and Table 3 for a list of available alternatives. Neonicotinoid insecticides can be orders of magnitude more toxic to pollinators than other classes of insecticides. There are currently a number of effective alternatives to neonicotinooids that are labeled for use against turfgrass insect pests. Table 1. Ecotoxicology of several common turfgrass insecticides in different animal systems. LD50 represents amount of material per unit body mass (mg/kg) or individual (µg/bee) required to kill 50% of a test population. LC50 represents the concentration of material in water required to kill 50% of a test population. Lower LD50 and LC50 values mean greater toxicity. *Toxicity refers only to active ingredient and does not account for formulation. Data from IUPAC. a LD for mammals and birds represents acute oral toxicity. b LC for fish represents acute 96-hour toxicity. cLD for honey bees may represent either acute contact or oral toxicity. Table 2. Neonicotinoid insecticides labeled for use in turfgrass and common arthropod pests controlled. *Always consult label directions for specific timing and application recommenations. a Labeled for use against sod webworms, but not cutworms or armyworms. Table 3. Alternatives to neonicotinoid inseticides labeled for use in turfgrass and common arthropod pests controlled. a For use only on turfgrass grown for sod or seed. b Labeled for use against sod webworms, but not cutworms or armyworms.